The YellowJacket is designed to accommodate rectangular inlets as well as square and round drains, and is affordable and simple to install and maintain. It features 2" polypropylene weather resistant straps that double as lifting straps to quickly and easily remove the filter, grate and all for simple cleaning. The high strength woven geotextile fabric has a flow rate of 200 gmp, and there are four overflow portals built into each unit. The Hornet's Nest is installed under-grate and has an oversized base that allows the filter to be used with a variety of size and shape grates. The sediment collection tube has 4 overflow portals to ease congestion during heavy storm events, and the webbing secures the filter to the grate and doubles as lifting straps to quickly and easily remove the filter, grate and all, for simple cleaning. 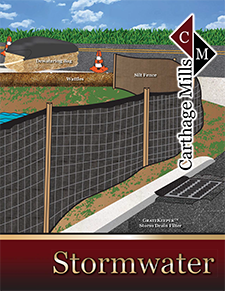 Carthage Mills’ GrateKeeper™ provides superior sediment control, with hassle free installation, and simple removal when necessary, and can be reused for the life of the project or longer. The GrateKeeper™ is available in either Regular Flow or Ultra-High Flow (300 g/min/ft2) and with an optional curb foam deflector to prevent sediment and debris from entering through curb openings.